The joy (chaos? panic?) of American Girl NYC in December | Oh, the Places We See . . .
American Girl Place New York never was at the top of our list of stores to see in December or any other time, for that matter. But when your granddaughter has asked Santa for Grace Thomas, the Girl of the Year 2015, and you’re within walking distance of 609 Fifth Avenue, you have to go there. Right? And we were hardly alone. In fact, if you are even the least bit claustrophobic, you may want to steer clear. After all, there’s nothing more panicky than crowds of well-dressed women (and some men) with cute little well-dressed girls in tow holding dolls wearing the exact same outfit as their owners. There was a rush on the sidewalk where we waited to get in. (The store holds only so many at a time, we were told.) And then there was a rush on each of the four floors to find the right doll and the right outfits — Better hurry, they get snatched up unmercifully — all in the name of sweetness and love, of course. The Girl of the Year section loomed large. Grace Thomas (2015) likes Paris and baking, so imagine cute sweaters, berets, travel luggage, and a whole kitchen with eensy little baking utensils. 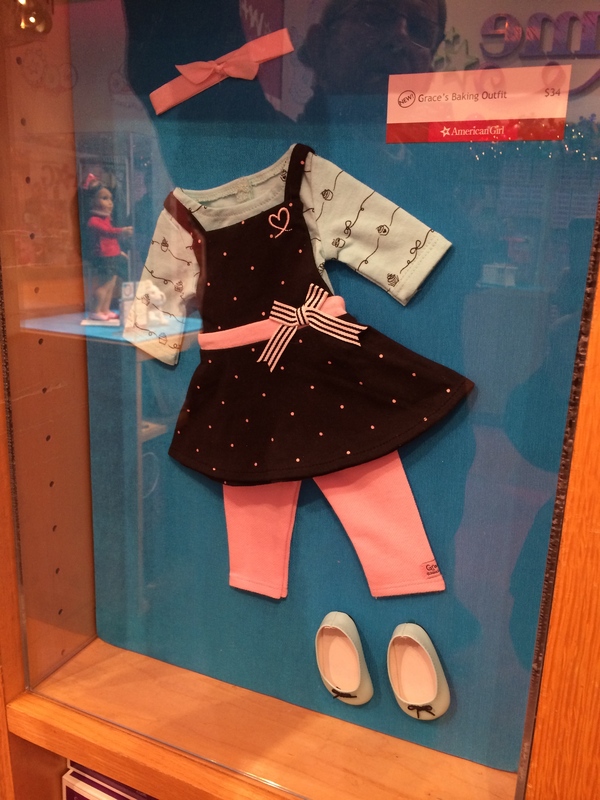 The Girl of the Year 2015 section at American Girl NYC. This was Grace Thomas’s home for the holidays!!! It could have been overwhelming were it not for catchy displays and tireless employees. Store clerks were helpful. So very helpful. And moms, too, directed us to related things we just had to have — desk, matching pj’s, and a “special” on an ice skating outfit. Little kids, noting our indecision, showed us what they liked so we could put that on our credit card, too! Grace Thomas with her Paris bistro set! Isn’t Grace Thomas cute in her Parisian sweater? No wonder she’s the Girl of the Year! Even the lines had a charm of their own. How often do you converse with five-year-olds and their dolls while waiting to fork over your next paycheck for dolly things? So, Bert’s at the end of the line, patiently waiting to pay. Did he mind? Did I ask? “It’s what’s you do if you’re a grandparent,” I told him. With infinite patience, the cashiers at American Girl made the sales and offered shipping — music to our ears! And then we explored the top floor where we heard there were parties goin’ on. That’s right. Genuine tea parties. And luncheons. Where gatherings of women and little girls and cute American Girl dolls sit at tables while waiters rush around serving tiny, tasty sandwiches and pink lemonade. Moms, daughters, and dolls (see them in their special chairs attached to the table?) 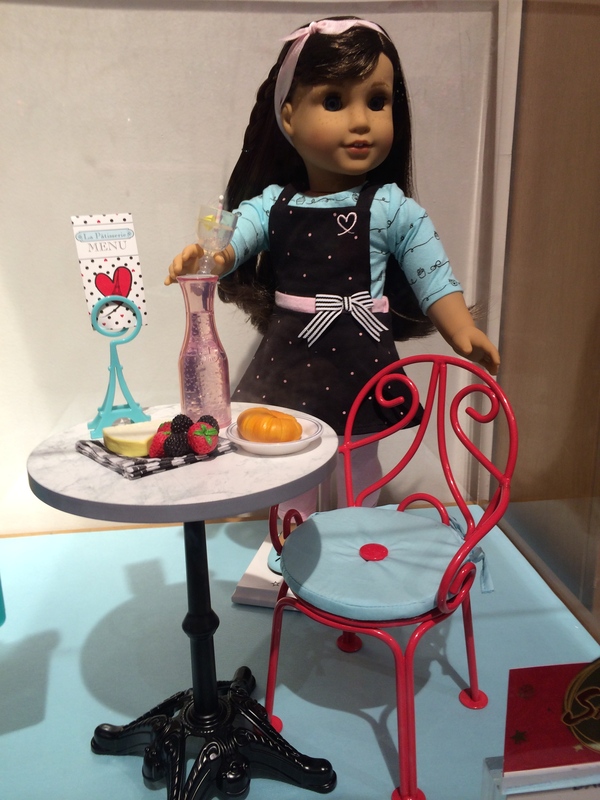 wait to be served at American Girl NYC. Of course, if your dolly needs a “do,” you could get her one. Right there. In the windowed room overlooking Fifth Avenue. Who wouldn’t want that? Hair styling for dolls is just part of the fun at American Girl NYC! We were amazed. No, that’s an understatement. The phenomenon of American Girl had never confronted us, the parents of two sons who were content with G. I. Joe’s and Transformers during their boyhood years. So we did a little research when we got home, looking to see just what this AG thing was all about. And here’s what we found. Begun in 1986, American Girl is devoted entirely to celebrating girls. With headquarters in Middleton, Wisconsin, American Girl operates 21 retail stores with 2,400 employees (except during the holidays when there are over 5,000). Over 27 million American Girl dolls have been sold since 1986. The AG catalog ranks as the largest consumer toy catalog in the U. S.
Over 72 million people have visited the American Girl retail stores. American Girl’s charitable giving over the years has topped $100 million in cash and products. So, yes, we put American Girl Place on our places-to-visit list when in NYC. And you should, too. In addition, if it ever becomes a public company, we’re buying stock! This many little girls and their moms can’t be wrong. It’s joy, chaos, and Christmas spirit rolled into one not-to-be-forgotten American Girl experience. This entry was posted in New York and tagged American Girl doll, American Girl Place New York, Doll of the Year 2015, Grace Thomas. Bookmark the permalink. Fabulous! 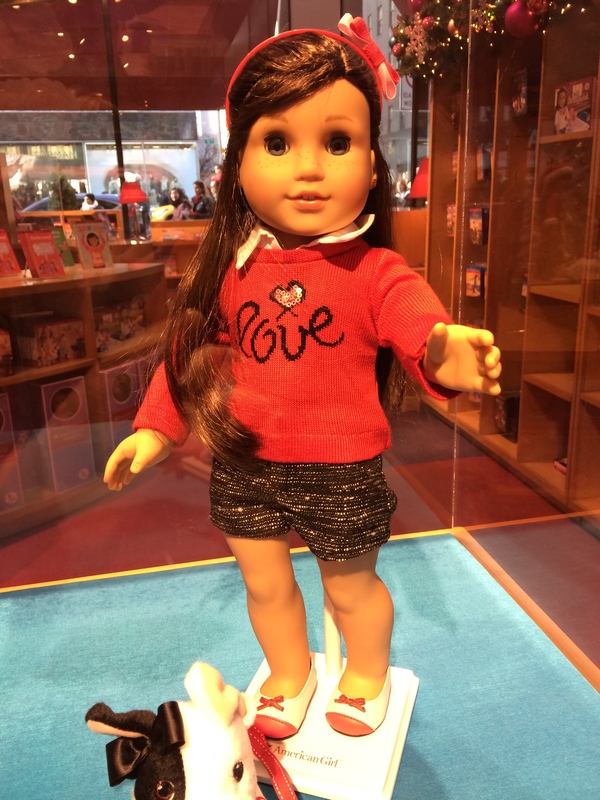 I went to the American Girl store in Chicago and was totally overwhelmed. Can’t wait till our girls get calm enough to enjoy some of these dolls – right now Emmie drags everyone’s dolls around by their hair aka pre-historic man style. Guess I’ll wait a bit longer for the AG investment! Save your money. And then if stock becomes available, invest heavily! These moms are buying (and so did we)! But what fun! I’m with the granddaughter who said, “Lulu, this is overwhelming.” It certainly is!!! And I’m still thinking about all the choices, the people, and the explosion of goods related to one basic doll. But maybe I’m just jealous — wishing I’d thought of it all! Thanks for reading! You bring up a good point, Judy, and one that I’ve been thinking about. This stage isn’t going to last too long, so we’d better make the best of it. We both enjoy Christmas, spending money, and fighting crowds. Although that may sound counter-intuitive to what most people feel, we say it just gets us into the Christmas spirit! So glad you have fond memories of your visits to AG. Love, Love,Love, your funny American Girl experience! Thanks so much, Vandy. It was quite the experience, for sure. And we’re still thinking about it since we saved a few surprises for an upcoming birthday rather than loading the granddaughter up all at Christmas!! Thanks for reading!